Every so often you wander into an LA spot and find yourself transported elsewhere: such is the case (in my book) with Hollywood's Bowery bistro, where–in an intimate, NYC West Village-esque, beautifully tiled space with specials scrawled across a chalk board–locals (like moi) dig on deeply flavorful burgers (served on English Muffins), wine and beer. (The pharmacy parking lot on Sunset & Fairfax also transports, but that's more like to a East Village crack den circa 1985, so that's another story). 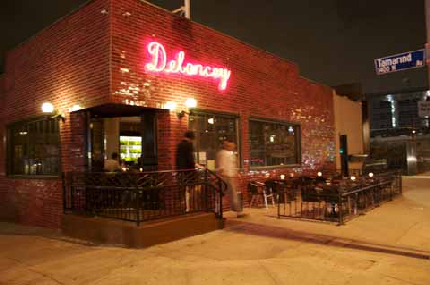 Well, according to Daily Candy's Weekend Guide today, the Bowery owners have launched a tasting room at their newest Hollywood spot: Pizzeria & Bar Delancy. Obviously, a Lower East Side NYC-theme rules the roost and, while DC focuses on the vino situation, I think some of those pizzas sound pretty amazing. Yes, in true lactard fashion, I especially like the sound of the Essex with Salumi, Cannelini Beans, Black Olives and Sheeps Milk Ricotta. BTW–I am an olive fanatic. Another fascinating tidbit about me. And another must-try place for pizza. Add that to the list . . . I'll get back to you with a full report!